Designs by Lisa Somerville: Stampotique Magical Mystery Tour! Welcome to my stop on the Stampotique Mystery Tour, if you arrived here from Joanne's Blog, you are in the right place. If you are just starting out here on my blog, you may want to jump back to the Stampotique Blog and start the tour from the beginning, be sure to leave comments as you visit the Designers Blogs, as there are TWO Mystery Prizes to be given away! This weeks at the Stampotique Challenge Blog, Valerie is your hostess, and her challenge is to dig into your scrap pile and use 'em up, the more scraps, the better! Why not play along with this weeks challenge using your Stampotique Images for a chance to win a $30 Stampotique GC, and a chance to be our August Guest Designer, click here for more details. I don't know about you, but I have ton's of scraps of leftover pattern papers (and card stock), so I put them to good use by creating a Quilted Card. The Quilt is created with MME papers and some coordinating Stampin' Up! card stock, I placed a Sheet of Scor-Tape on my grid sheet when forming the quilt, it was much easier than applying adhesive to each piece. I distressed the edges and embossed the quilt with the Damask Texture Fades Folder. I stamped Olive Rose in Carmel on Vanilla card stock, then added this sentiment in Chocolate ink, and cut with Spellbinders Petite Oval, layering on Labels Twenty. I created some rolled flowers by punching 1-3/8" circles from pattern paper, then cutting the circle to form a spiral and rolled with a Petal Roller and glued in place - this all from scraps! Thanks for stopping by, you next stop is the talented Gez Butterworth's Blog! Remember, as you make your way through the tour be sure to leave a comment on all the Designers Blogs, because there will be 2 prize winners chosen randomly amongst the blogs. The tour ends on June 28th and the winners will be announced on the SDC Blog on June 29th. Amazing what you cre8ed with scraps, beautiful card. I just love that saying, off to hop! love this..love the texture Lisa! Wonderful card and background, Lisa! What a beautiful card!!! Love the colors, images,and the saying. Great job! Like the effect of the embossing & overall quilt look. Love the quilt background and the rich colors. Beautiful scraps of quilt. The rolled flowers are beautiful! Adorable card, Lisa! I love,love, love that image of Olive Rose. Have a great rest of the week! Wonderful how you pieced this background together...nice card! What a stunning quilted background. Amazing work! It's gorgeous!I just love that background! 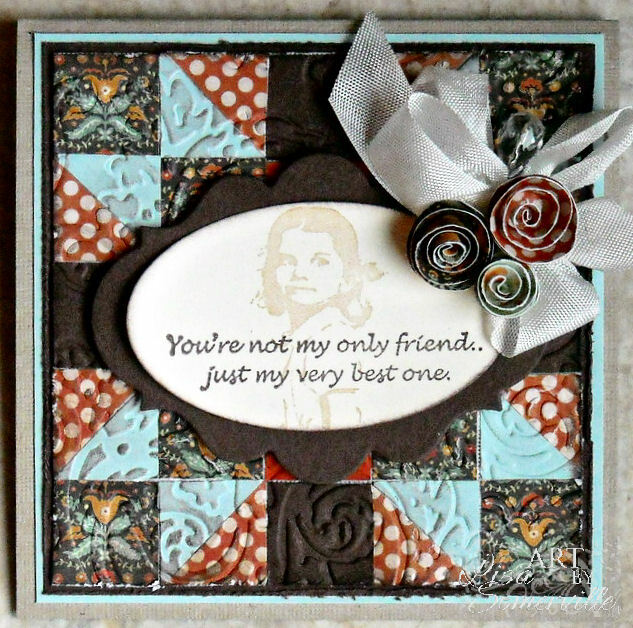 love this, the quilting and embossing looks so great with the Olivia Rose image! Gorgeous card. The quilted background is amazing. Great quote with image. Love it! Lisa, such a stunning patchwork quilted background! Great use of scraps! Love the image and sentiment also! What an incredible use of scraps. My MIL is a quilter and would love a card like this. Thank you for the inspiration. This card has such a warm and inviting feel to it Lisa :) The sentiment works so great with the image and colours too ! Very pretty and a good tip about using the strips of tape behind the squares. I hadn't thought of that. Lisa your cards are always look very proffesional. great quilt background. WOW! What a stunning background! Awesome job! Really beautiful way of using scraps!! Love the sentiment! It's perfect with that image. Fabulous use of scraps- very effective. Love those flowers! Your card is breathtaking, wonderful quilted background. Love the quote. Beautiful card! I love the symmetry and your choice of scraps to build the colour blocks - so effective and striking. And the coordinating flowers just bring it all together. A special card for a special friend. Love the textured quilt background. That paper quilt background is stunning and the idea of then embossing it gives it such depth. I will surely remember that idea! Are these really scraps? So elegant.